Milder riding weather tomorrow before a predicted afternoon change. Venue is Darnum departing at 8am. Have your batteries charged and light on for the ride. Please ride safely and courteously observing all road rules. 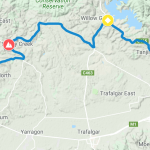 There is a recreational ride associated with the Herald Sun Tour event on Sunday 3 February 2019. This message was sent to me for distribution. I just wanted to reach out and let you know about the Jayco Herald Sun Tour which will he heading your way in a few weeks (30/1-3/2). The Mens 3 Stage will be starting in Sale on Friday 1st of February and it would great to see local faces supporting the riders. The first day of the tour includes a Ride Phillip Island which enables members of the public to ride the Grand Prix track. This is a free race taking place at the Phillip Island Grand Prix Circuit in between the Women’s and Men’s first stage. Ride Melbourne is Australia’s brand new FREE community cycling event taking place on Sunday February 3 prior to the final stage of the 2019 Jayco Australia Herald Sun Tour. Participants will have access to closed roads around Melbourne’s Royal Botanical Gardens; offering a unique experience to ride the same circuit as Australia’s best cyclists. I think this would be a great opportunity for the members of Warragul Cycling Club to get access to the track and ride a unique location. It would be fantastic if you could share/discuss the following link with the group. If you have any questions about the event please let me know. Ride Melbourne is Australia’s brand-new FREE community cycling event taking place on Sunday February 3 prior to the final stage of the 2019 Jayco Herald Sun Tour. Ride Melbourne provides participants an exclusive opportunity to ride on the official closed roads of the Jayco Herald Sun Tour Royal Botanic Gardens circuit only hours before the world’s best cyclists take centre stage. Free from the hustle and bustle of Melbourne’s traffic, Ride Melbourne encourages members of the community of all riding abilities to dust off their bikes and join in the fun and excitement of the day’s cycling entertainment. Ride Melbourne is proud to partner with the Amy Gillett Foundation as the official charity partner to help promote their commitment in providing a safer cycling environment in Victoria. Thanks to Cycling Australia and the City of Melbourne, the event will feature an amazing festival hub with live music, kids activities, cycling safety workshops, education sessions, food vans, a bar and so much more. Come and enjoy an awesome afternoon of cycling in heart of Melbourne with the whole family. Registration is FREE and open to all ages, plus the first 100 registrations will receive a complimentary premium Gatorade drink bottle. Come down and be part of the excitement. Happy New Year all! Wishing 2019 will be a safe riding year and all of your wishes will materialise. Summer certainly has arrived with several hot days towards the end of 2018. Warm weather continues at least for the next week. Tomorrow will be a perfect morning for a ride where it will be partly cloudy with winds northwest to northeasterly 15 to 20 km/h tending west to southwesterly 20 to 30 km/h early in the morning then tending southeast to southwesterly in the late afternoon. Overnight temperatures falling to between 15 and 19 with daytime temperatures reaching 24 to 33. It will be Darnum departing ay 8am so please be ready for the ride with batteries charged and lights, both front and rear on for our ride. Ian unfortunately will not be riding as he will be away for the weekend. Firstly Happy, Safe and healthy 2019 and the years beyond! Trust you celebrated Christmas and brought in the New year in the usual celebratory manner and are now in a position to work off your celebratory cheer for our first ride together in 2019. After a very warm Friday with temperatures ra]reaching 35+deg tomorrow will be a lot cooler. It will be Darnum departing at 8 am tomorrow. Please have your batteries charged and light on for our ride. The last few day has seen summer arrive in a vengeance. Humid warm weather however predicted for tomorrow. Being the last day of the month and the year we’ll start from Yarragon departing at 8am. Humid and mostly cloudy day tomorrow with a high (70%) chance of showers in the south, medium (40%) chance elsewhere. The chance of a thunderstorm near the coast in the late afternoon and evening. Winds northeast to southeasterly 15 to 25 km/h tending northwest to southwesterly early in the morning then becoming light in the late afternoon. Overnight temperatures falling to around 20 with daytime temperatures reaching 23 to 30. Due to popular demand there will be a ride tomorrow morning from the Warragul clock tower departing at 7am. Depending who turns up the ride will be between 30 to 40km. Last ride before the big day – Christmas! Rather than starting in Darnum we going to start at 8am from Yarragon for a medium length ride before finishing at Fozziegobbles for coffee and a bit to eat. All welcome.